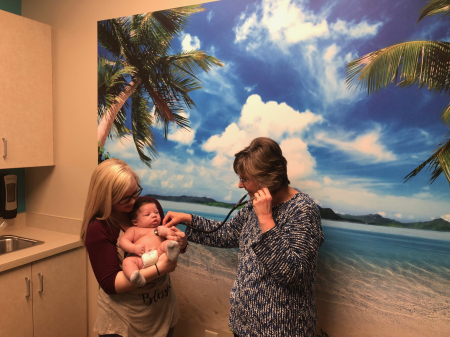 The immunizations we provide your child during their well check ups are one of the most important ways we can provide your child with defense against many of the serious pediatric diseases. Our immunization schedule is based on recommendations by the Academy of Pediatrics and the Center for Disease Control. Many of the vaccines have age ranges for which they are recommended, therefore, you might notice slight variances in the vaccine schedule adopted by different pediatric practices for each age checkup. Each checkup we have designated vaccines your child should receive, however, there may be some changes if he/she has fallen behind in the schedule or misses some of their checkups. Most of the primary series of vaccines are completed by 18 months of age and the boosters are given at age 4-6 years. If new vaccines are developed or new recommendations are made on existing vaccines, then we will begin doing "catch-up" vaccinations on older children who have not already received the newly recommended vaccine. We as the physicians of Tuscaloosa Pediatrics P.C. are strong advocates of the benefits of immunization and encourage you to keep all your regularly scheduled checkups and receive the immunizations as recommended by the Academy of Pediatrics and the CDC. If you have questions always feel free to ask your doctor but please also click on the link below where we have provided you with a list of reliable resources on the web concerning immunizations. Diphtheria is a bacterial respiratory disease that lives in the mouth, throat and nose and can cause serious complications such as heart failure and paralysis. Sometimes a thick membrane can form in the back of the throat making it very difficult to swallow. Haemophilus influenza type b, or Hib is a bacterial disease that can cause meningitis, arthritis, pneumonia, and most commonly inflammation and swelling of the throat. Hepatitis A is a viral disease that causes fever, vomiting, abdominal pain and jaundice. It is most commonly spread by contaminated food or water. Hepatitis B is a disease of the liver that can cause liver failure. Symptoms can include jaundice, fatigue, and loss of appetite. If chronically infected it can cause cirrhosis or liver cancer. Human Papillomavirus is the most common sexually transmitted virus in the U.S. and has been directly linked to cervical cancer and genital warts. Influenza is a highly contagious respiratory virus. People with underlying health problems are particularly at risk from the flu and pneumonia can be a deadly complication in even normally healthy people. Measles is a highly contagious viral disease that often manifests itself as a rash, fever, & cold symptoms. Approximately 1 out of 1000 children that get the disease will get encephalitis which can cause deafness, mental retardation, or seizures due to swelling of the brain. 1 in 20 will get pneumonia which is the most common cause of death with measles. Meningococcus is a bacterial disease that can cause meningitis, pneumonia, and blood infections. This disease can be very serious and leaves effects such as permanent deafness or loss of limb, and in many cases death may occur very quickly from this overwhelming infection. Mumps is another viral disease. It usually causes swelling of cheeks and jaws but can progress into meningitis, encephalitis, or even sterility in males. Pertussis (whooping cough) is a disease that causes violent and repeated coughing often causing the child to turn blue from lack of oxygen. Pneumococcus is a bacteria that can lead to meningitis or a serious blood infection. Polio is a viral disease that can cause pain and stiffness in the back, arms, and legs. This disease can lead to lifelong paralysis and then death if the breathing muscles become paralyzed. Rotavirus is one of the most common causes of severe diarrhea and dehydration in babies and young children. Rubella (german measles) is an illness causing a rash on the face and neck, fever, and swollen glands. Rubella is most dangerous if contracted by pregnant women. If contracted early in the pregnancy there is an 80% chance of the child having birth defects. Tetanus (lockjaw) is a bacteria that enters the skin usually through deep puncture wounds. It causes muscle spasms in the legs, arms, stomach, and especially the jaw. These spasms can be severe enough to break bones in young children. Varicella (chickenpox) is still one of the most common childhood diseases usually appearing as blisters then scabs all over the body. Serious complications like encephalitis or severe skin infections have caused death in some children.